Contact Us Today for Your Next Tow! Need a tow? Call a Pro! 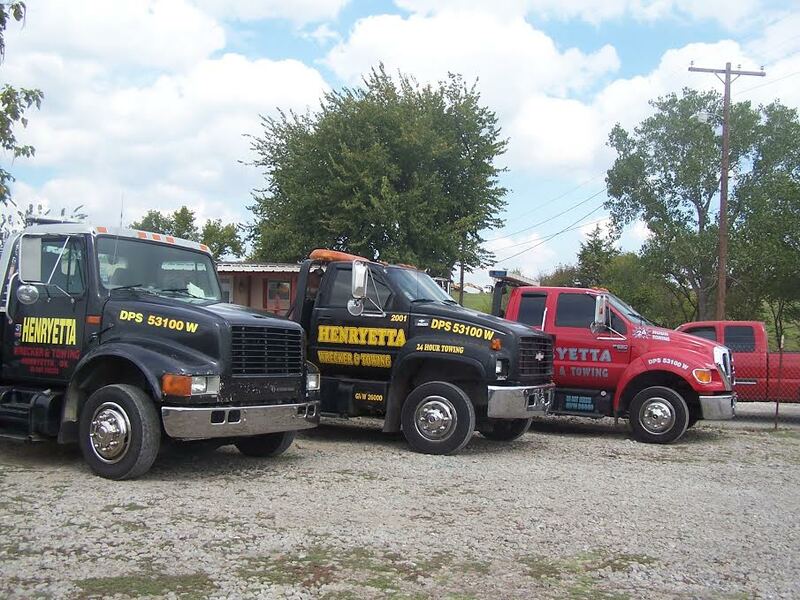 Founded in 2008 and under new ownership since 2011, Henryetta Wrecker & Towing is proud to be your local, family owned and operated, 24-hour roadside towing and assistance services. We serve Henryetta, Interstate 40 and the surrounding communities with prompt, reliable and friendly service. When you’re stranded on the side of I-40, having someone reliable, fast and experienced who you can call for help becomes more important than ever. For folks in need of towing in Henryetta, OK, that someone is Henryetta Wrecker & Towing. Since 2011, our family has been providing exceptional work and customer service to our valued customers. We are proud to offer a wide range of roadside services, including accident recovery, car carrier services, motorcycle towing, custom vehicle towing, and more. We love being able to help our friends and neighbors when they are in a tight spot, and we are proud of our reputation as a dependable and friendly local business. Proud to provide outstanding customer service and the cleanest trucks possible to ensure a comfortable experience. Performing our best to ensure 100% Damage free services. We have multiple different insurance companies under contract, therefore we are able to directly bill the roadside assistance insurance company as much as possible. Our prices are always reasonable. "My husband, daughter and I were on our way to move down to Arizona. But on our road trip down in Oklahoma on I40W just about 10minutes from ..."
December 17, 2018 Bryan L.
"We were in our car going to a car club meeting 3 hrs away from our house.Our car lost power about half way there and we called AAA,they sent..."
"We were in a real bind and Eric was totally AWESOME!!! He was there in about 10 minutes and drove us and the car to where we needed to go! H..."
"Henryetta Wrecker & Towing was very helpful sending a tow truck for my pickup and a second truck to pull our 5th wheel. They recommended and..."
"Just calling ahead to Towing Services along the Henrietta stretch of I-40 for a trip tomorrow. Trying to be prepared IF I needed roadside ..."